I know what you guys are thinking “Why the heck would you see a movie made in the 20’s?” Here’s my reason, I’m not a huge fan of the Twilight saga I think the vampires portrayed in those movies have too much of a fashion sense. I mean vampires are supposed to be blood thirsty monster, not monster that were too much makeup! That’s why I wanted to see Nosferatu the granddaddy of all vampire movies. 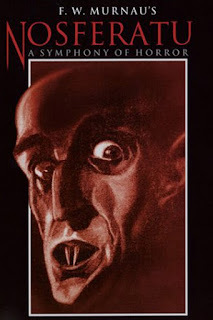 I have to tell you the movie was pretty old, if you like opera, silent plays or things of that sort you will love this movie but I don’t like any of the above, so I found it quite boring just as boring as Twilight but the difference is Nosferatu was made in 1922, when was Twilight made? don’t even care. But I have to accept whenever I saw the guy who played Nosferatu (Max Schreck), I knew he meant business, can’t quite say the same for Edward Cullen. To put it into perspective, if I see Nosferatu in a dark alley I would die of a heart attack but if I saw Edward Cullen, I would try to mug him. Max Schreck, The guy who played Nosferatu was awesome, other than that, the way the novel was adapted into the movie was also nice, but the guy who played Hutter (the guy whose wife Dracula is after) was really, really irritating, I was praying to see him get killed in the movie, but doesn’t happen. The story starts with Thomas Hutter (Gustav von Wangenheim) visiting his new client in Transylvania, Count Orlok (Max Schreck). Hutter soon suspects that the Count is a vampire. Soon he finds out that Orlok is a vampire, as Orlok traps Hutter in his castle and leaves on a ship to England. When Orlok reaches England he falls for Hutter's wife Ellen (Greta Schröder) and tries to turn her into a vampire. Now, Hutter must somehow stop Orlock! That's the basic story. My advice is, if you’re a movie nut and you feel that you must watch this movie go ahead, knock yourself out. I'm clearly not qualified to rate this movie but I'll do it anyways.